The fish dinner at St. Ambrose Parish in Bristol is a little more expensive than the typical Lenten meal offered by churches in Vermont. That’s because theirs is all you can eat. On what is essentially a fast day until supper, according to the Vatican’s Code of Canon Law, an invitation to potential gluttony may seem surprising. But it certainly brings out the hordes, Catholic or otherwise. Last Friday evening, the bright basement at St. Ambrose, still decorated with faux pine branches and lights from Christmas, was packed to the gills with diners supping on ecumenically acceptable fare. Dinner for adults was $12. Father Pierre LaVallee, the priest in charge of the assembled flock, stood behind me in line. “How much for a member of the clergy and a senior?” he asked the parishioners selling tickets, indicating his clerical collar. “That will be $12,” joked one older woman. With or without respect, I was ready to eat all the fish I could. At its fish fries, held every other week during Lent, the parish of St. Ambrose offers fried and baked planks of haddock. The church has been fish frying for 12 years, since a parishioner proposed it, and the business of feeding the community keeps getting bigger. St. Ambrose now owns its own frying equipment — enough, in fact, that the church had to purchase an outdoor tent to house it. I presented my ticket at the cafeteria-style window and asked the lady doling out fish for samples of both baked and fried versions. She placed two pieces of each in a paper container, then covered them with a heap of fries and urged me to come back for more. 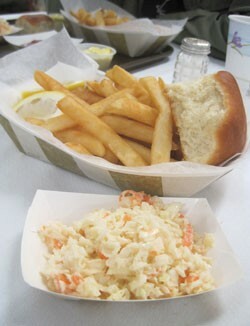 I also nabbed a smaller container filled with coleslaw and a roll. At a table across from the pickup window, an array of condiments sat ready for self-service. I chose several fresh lemon wedges and filled a bowl with ketchup. I also picked up a pat of Cabot butter and a petite cup of homemade tartar sauce. At another window, members of the youth ministry offered Pepsi products in paper cups. Nearby, a woman sold home-baked desserts. But people who went out for burgers would be missing the fun. Though prebattered, the peanut-oil-fried haddock at St. Ambrose was firm, crispy and flavorful, a perfectly acceptable meat alternative. The baked pieces fared less well, and had a fishier flavor and slightly mushy texture. On this supposed fast day, the unlimited fries and fish left me nearly incapacitated. Of course, the sweet, almost doughnut-like roll didn’t help (or hurt), either. At least the coleslaw provided some roughage. The vinegar-based salad of cabbage and carrots got its standout flavor from the addition of garlic and onion powders. As a gentleman with a cane and an anti-Obama shirt that read “Change It Back” filled his plate with the last of the fish, I decided it was time to try dessert. The parishioner manning the table encouraged me to sample all four varieties of brownie. While they tasted as if they’d all begun as the same Duncan Hines mix, the variation in quality was staggering. One brownie had crisp edges and a chewy center; another was too dry to eat. Confetti cakes with white and brown frostings and German chocolate and vanilla cakes filled the rest of the table. At meal’s end, parishioner Martha Hanson asked if I’d enjoyed myself. Hanson takes Fridays off work during Lent to prepare the fish fries, starting in the early morning. I told her I’d liked the fish and the positive vibes from the cooperative crew of more than a dozen fellow parishioners, all in official fish-fry aprons. Of all of the fish fries happening in Vermont’s churches, Hanson was surprised I’d chosen hers. “Somebody was leading you to this one,” she suggested. Maybe so. I didn’t know abstinence could taste so good. All-You-Can-Eat Fish Fry. Friday, April 15, 5-7 p.m. at St. Ambrose Parish in Bristol. $5-12; $35 for a family of five; 453-2488.